Using the yuloh on AUKLET has become quite matter of fact and routine. I don’t use it as much as I might, because it’s easy to overdo, but it’s a lovely alternative to the motor. A yuloh is a curved, or bent, Asian sculling oar, used off the stern of the boat. It has a wooden socket in the middle of the loom (the long skinny part of an oar), somewhat nearer to the handle end, and that socket fits onto a metal pin on the transom. In this case, it fits onto a bicycle trailer hitch ball, roughly 1/2 inch in diameter, mounted on a post to get it up to the correct height. At the handle end of the yuloh there is a lanyard tied from an eyebolt in the handle to a low point in the cockpit. In use aboard AUKLET, the yuloh is slid from its storage location along the port sidedeck and then slid off the port side of the back of the boat. Once the blade is floating in the water it’s easy enough to lift the handle and drop the loom socket down onto the transom pin/hitch ball. On this boat, the yuloh lanyard is generally stored tied to its padeye in the cockpit, so it’s easy to pick up the end and tie it to the eyebolt in the handle of the yuloh. Most folks use a yuloh from a standing position, which is ergonomically nice, allowing for swaying side to side using bodyweight to provide the power. But it turns out that you can also operate a yuloh from a seated position, facing the center of the boat, and alternately pushing and pulling on the handle and the lanyard, also using bodyweight in the process. The lovely thing about the physics of a yuloh is that the combination of the bend in the loom, and the lanyard at the handle end, works to cause the rotation needed to make sculling work. This takes a lot of the strain off of wrists and elbows, and allows for a simpler push/pull motion. Getting the yuloh to work on AUKLET was a progression. Initially the biggest problem was that the yuloh tended to jump off its pin. I tried a Velcro strap, which of course the yuloh pulled right off. I tried different positions – in the original construction we included three sockets in the loom, not knowing exactly which location would be best. I tried different adjustments to the length of the lanyard. There was still a lot of jumping, and some frustration. Finally it occurred to me, about the third time of getting the yuloh out and trying again, to try gentle pressure downward on the loom to see if it would make a difference. Gentle pressure down on the handle was helpful (pressure near the pin made little difference). Since I didn’t want to have to apply that pressure ongoing, it seemed like adding some weight to the handle might do the trick. I happened to have a spare 4 feet of 3/16″ chain already on the boat, and it was easy enough to wrap that around the handle and tie it with a stray sail tie. Bingo! Yuloh training wheels! For the next many uses of the yuloh, each time I pulled it out I would then wrap the chain around the handle. Once, after a few rounds of this, I tried using it without the chain, but it was back to jumping off its pin. Another quite a bit of use went by, and then I had a peaceful opportunity to try it again sans chain. Two things had changed: I had become much more accustomed to the rhythm of pushing and pulling both the handle and the lanyard at the appropriate moments, and the socket in the yuloh loom had become worn on the sides, creating a more sloping shouldered edge. I expect that both of these changes had something to do with it, but whatever it was, I had graduated from training wheels to operating the yuloh without the additional weight. That sure simplified things! 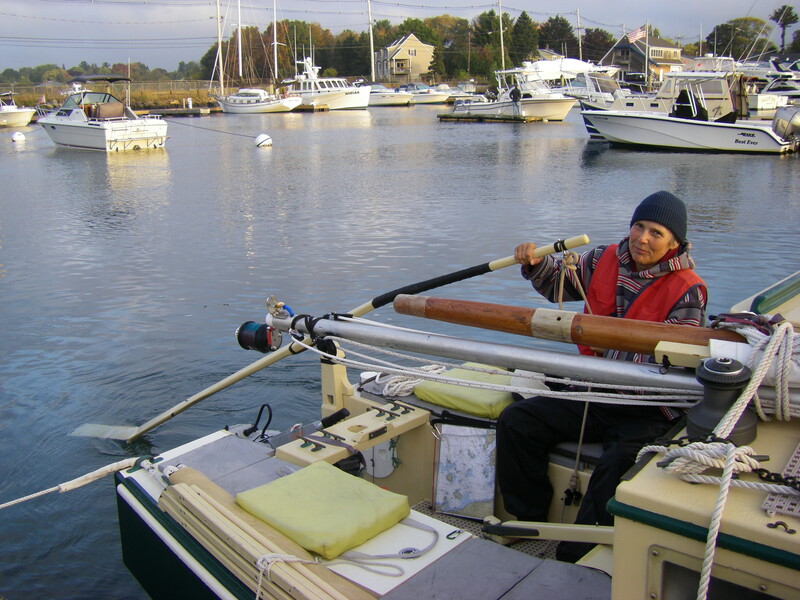 I’m still working on getting better at steering – it seems tricky to get the same amount of force on both the push and pull stroke, and I spend a lot of time making steering adjustments by using my feet on the tiller. But I do think that this will improve also, and theoretically it should be possible to fasten the tiller and steer by adjusting yuloh strokes. I’m still working on that. However, it’s possible to go in a generally straight line, and to arrive at a chosen destination, even if the execution isn’t perfect. Now, if the wind dies and where I want to be is somewhere not that far away, it’s easy enough to get there. Maintaining the motor as decoration is much more realistic and doable, since having the yuloh, and my sense of security if the motor were to fail outright is much stronger. In Asia, it’s often the women who do the big yuloh work, including on enormous barges, and often with a baby on their back. First off, we know that those are hard-working women. But it’s also a testament to the mechanical elegance of this particular tool, and its ability to use available strength in a very efficient manner. It’s a lot of fun to be putting it to use in this setting. Since my highest priority was to have the easiest use possible, adhering to as much traditional design as possible seemed like a good idea. I wanted a piece of equipment that could move a giant barge, on the theory that with the strength that I was dealing with it might make it possible for me to move my boat. I wished that the article mentioned above had included more detail about the socket and the pin in traditional yulohs. More specific information about angles, depths, and diameters would have been helpful. [See update on this at bottom of this blog post.] We were concerned about weakening the loom by putting sockets directly into it, so we added a piece of teak with the sockets hollowed into that. It’s possible that this might have contributed to the jumping off the pin issue, because it takes the sockets away from the horizontal centerline of the loom. But since the jumping issue has now resolved, it’s also possible that it didn’t. I do like that the loom is stronger at the sockets, rather than weaker, with our arrangement. Even with the chain weight training wheels, only one of those sockets made the system work without jumping. And the lanyard length was important. I stitched a couple of pieces of colored whipping twine into the lanyard as markers, where the lanyard was tied at each end, so that I could keep track of what length was working. Interestingly, this made it possible to see just how much the knots were slipping, as well as making it easy to get the yuloh into position with a minimum of fuss. Anke and Dave made a new yuloh this year, and Anke mentioned that it really made a difference to use a thicker lanyard rather than a thin one, because it made it easier on your hand. Based on her saying that, I used a piece of soft braided 7/16 line for the lanyard, and have been happy with that. I tied a good-sized stopper knot about where I thought my hand would go to help make it easier to hold, and I have found that useful too. But nowadays I seem to like my hand placement somewhat above where the knot is, and I haven’t gotten around to re-tying it, and have been doing pretty well just holding the thick line. It’s that stuff called Posh, from R & W Ropes, and it’s particularly nice and soft and fuzzy. I think that the more slippery double braid wouldn’t be as much fun, requiring more hand-muscle to keep one’s hand from slipping when working the lanyard. A nice extra thing about the lanyard is that when you prefer the blade out of the water, it’s easy to push the handle down and wrap the lanyard two or three times around the handle, which means that the yuloh will be at rest on its pin with the blade out of the water. This is convenient for taking a break, and also for those times when a little breeze comes up but it may or may not be going to last. It works just fine to sail with the yuloh in its raised position, until it’s needed again or it’s obvious that it won’t be needed and can be put away. That’s about it for the yuloh details. Photos http://smu.gs/1b67GnD include the yuloh in position for use, the lanyard wrapped around the handle to raise the blade out of the water, and a close-up of the socket arrangement. So far we have no photos of this yuloh in real use, rather than at the dock, but hopefully one of these days when I’ve got it out to move the boat there will be somebody with a camera nearby! I had the pleasure of seeing the following because the page you’re looking at right now was listed! Some of the entries in this reference include links (also copied below) to video of yulohs in use. These have been particularly helpful for seeing how this tool is properly used – note hand placement on the lanyard, immediately below the yuloh handle, and body movement front to back, crossways to the centerline of the boat. In the first video below, in the canal, one of the yuloh operators has also added some interesting bits to the deck, for foot support. the yuloh powered boats in this video look like modern canal water taxis – a little like the Chinese equivalent to Venice. and THIS one, in Shanghai harbor! I’ve recently had the pleasure of an e-mail exchange with Slieve McGalliard, who wrote the above linked yuloh article, and this gave me the opportunity to ask questions, as I’ve continued to puzzle over pin angles and socket depths. He shared a photo of a traditional yuloh pin, taken of a model in a museum, which I have since found here: http://freepages.genealogy.rootsweb.ancestry.com/~fassitt/cranks/mar-mus_sampan.html (scroll down about two thirds of the page for that photo.) This pin is angled at about 30° aft. Regarding the question about the depth of the socket, one possibility is that traditional sockets are shallower than I would have thought – a little over half the diameter of the ball at the top of the pin. This could use some further experimentation! This article discusses that on their schooner Easy Go, Bob and Kathy Groves used a half-inch diameter pin, rounded but without a ball, set vertically (plumb). Their article does not include information about socket depth, but does say that the socket is angled at 45°, drilled into a board that is fastened to the underside of the yuloh loom (shown from the side in a photo near the end of their article). Thanks for the yuloh details! I was especially interested in the height and jumping issues: I gave up on my yuloh after a few tries, probably due to these very things. My hitch ball is mounted at the top of the transom.) I wil have to make a higher mount and try again. So glad it’s useful! You might also consider the temporary weight on the handle – it’s really surprising what a difference it made. Today we got to weigh the chain – it’s 1 lb. 12 oz. I’ve been thinking that ankle weights for exercising would be an easier way to do this. Any way around, I hope you have some success! I’d be interested to hear how it goes. I’m sorry to say that I have not followed through on that, having sort of wandered off into other directions. But now having your question, I’ll take another crack at it! The loom on this yuloh is more delicate than most – it suits my particular use, but it seems like most folks like them heavier. When Theo is back next week we’ll get some proper measurements, but until then, the basic idea is that it’s no more than 1 1/2 inches thick anywhere, because we made it out of a 2 x 8. The lower part of the loom is wider than it is thick, to give it a bit more strength. Anyway, with luck we’ll have measurements for you next week sometime. I’d be willing to bet that a yuloh will push a SCAMP beautifully. As discussed above, sorting out the pin height in accordance with that article “Some Thoughts on the Yuloh” could be pretty crucial. Also, the correct length for SCAMP could be shorter than what we did, affecting that pin height. The definite measurements are still on hold, but if I remember right, the blade is 6 inches across, for at least a couple of feet from the lower end, before the gradual taper that shows in the photos. We shaped the edges like that double airfoil pattern shown in the article (thickness measurements forthcoming). I couldn’t really find guidance about how to handle the end, so we took a guess and shaped it with the same curve as the sides, blending them at the corners – this is something like the way some airplane wings look. It’s important to put the flat surface of the blade facing away from the boat. 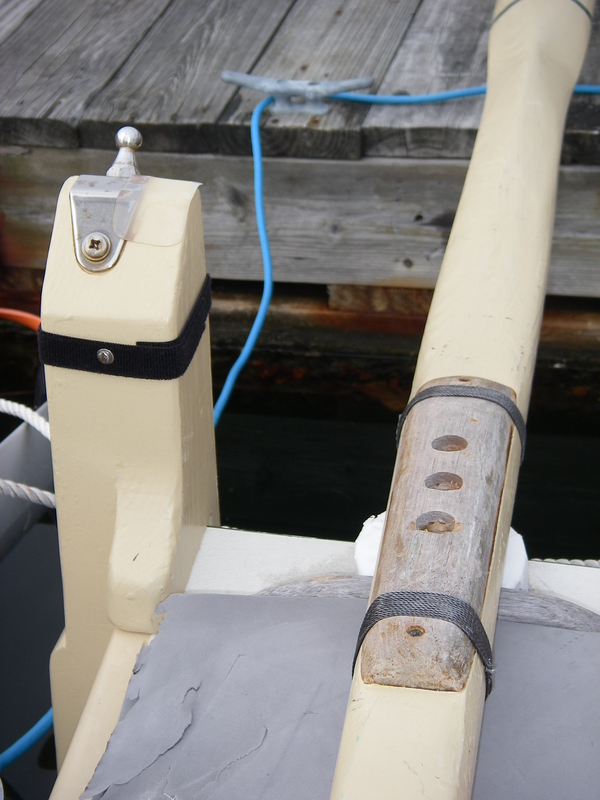 If/when I do this again for a different boat, rather than the bicycle trailer hitch I would use a rounded vertical rod, like they did on Easy Go (article also linked above, in the main post). Whoops – I wrote a response to you in my head, and then forgot that I hadn’t actually put it in print! That all sounds great, about your plan. How’s it going now? The one half inch rod seems like a good way to go – nice and strong. How perfect that you have the lathe and the skills for easily shaping the end. It’ll be great to see your blog post about the whole process, and I’ll be delighted to include the link with the references here. In spite of the time lag, we have actually been working on yuloh drawings here – there should be a new post sometime soon, to share those. Thanks so much for inspiring getting back to that! PS the boat looks fantastic!